Fiction writer Joan Leegant‘s work has won her, among other honors, a Winship/PEN New England Book Award and a 2000 MCC fellowship, and opportunities including a guest lectureship at the U.S. State Department in Israel. Her new novel Wherever You Go is about to be published by W.W. Norton & Co; we advise, if at all possible, that you hear her read from the book at a local event (see list below). We asked Joan, recently returned from a semester teaching in Israel, about Wherever You Go and about her process (and life) as a writer. Always a pleasure to talk shop with someone so deeply engaged in the craft! ArtSake: I’m curious about what drew you to this story of three Americans in Israel whose lives are shaken by radical extremism. Where does a story start for you? Joan: The story began with the characters. From the characters a plot arose. That is, I follow the characters to see what they do, and hope they do something interesting enough to keep a reader engaged and turning the pages. That said, I did set out to write a book about Israel, and specifically about Americans in Israel, because that interests me a great deal. I’ve spent a lot of time in Israel, lived there for some years in the late 70s, and since 2007 have spent half the year in Tel Aviv where I’ve been the visiting writer at Bar-Ilan University. So while I didn’t set out to write a book about the attraction to a cause and the pull of radical Jewish extremism, the fact is that extremism is part of the political reality in Israel — and of the whole Middle East. It’s naturally something I think about, have read a great deal about, and care deeply about. So it’s not a surprise that some of the characters in my book are drawn to it. In this respect, character and subject developed simultaneously. ArtSake: You came to fiction writing after years of practicing law. Do you think this “pause” before launching head-on into a writing career affects the way you approach your writing now? Joan: It’s nice of you to call the years of practicing law a “pause” rather than a delay. Or a “late start.” Or identifying me as the patronizing “late bloomer,” a term I don’t like because it implies we “bloom” only once, and only early in our lives. I was just shy of 40 when I began to write fiction, which I imagine is different from starting at 25. For one thing, I didn’t have some of the pressures younger writers have when they are just beginning and not publishing, and family members are telling them to give up and go to, say, law school. Because I already did that. This allows for a certain amount of psychological freedom and, perhaps, patience. I also had two small children by then, which I think provided a helpful balance. Life was full and complicated and sometimes overwhelming – I also had part-time jobs – but it also helped me keep perspective. Writing was important, but it wasn’t everything. Having children helped me stay grounded. On the other hand, I do feel mortality pressing down. There is a palpable urgency, a need to not waste time, to bear down on the truth, and to come out and say what I think is important. Maybe all writers feel this way regardless of their age; I can’t say. ArtSake: On your Web site, you note that you wrote much of your novel at artist colonies (Yaddo and MacDowell), and revised it while in Tel Aviv. How important is your physical setting, as a writer, to your process? Was there something about those localities that led themselves to the tasks at hand? Joan: Artist colonies are wonderful. I had the great fortune to go to MacDowell four times and to Yaddo once, for stays that ranged from three to six weeks. What colonies offer above all is solitude and time, with no distractions or obligations. At MacDowell, for instance, you are given your own studio in the woods with perhaps one other studio in sight. You’re left alone to work at whatever hours you choose, no interruptions except what you seek out, meals provided but even those aren’t mandatory. When I was there, in the early 2000s, there was no cell phone service and no internet in the studios; you checked your email in the main building outside the dining room on one of two shared computers. What this gives you as a writer is not only the time to write without distraction but the ability to sink deeply into your work — because you don’t have to continually surface back into the everyday. You don’t have to keep finding your way back in because you never have to climb out. It’s this sustained attention that is very hard to achieve in regular life. As for the physical settings, Yaddo and MacDowell are both located in beautiful wooded areas where there’s lots of quiet. They’re also in lovely towns you can go to when you need a break from that intense inward focus. You can go to a cafe or a drugstore or the movies and get away from yourself for a little while. ArtSake: Do you share works-in-progress with other writers? How important is it to you and your work to maintain that connection with other artists? Joan: Three writer friends looked at the manuscript of Wherever You Go at different stages and gave me terrifically helpful feedback. I have done, and continue to do, the same for other writers. I think it’s wonderful if writers can help each other this way. I also value these connections for the psychic support they provide for the writing effort itself. I’m not in a writing group and don’t socialize with a lot of writers, not on principle but just because that’s how my life has been, so these connections are especially important to me. They make me feel less alone, more part of a community, even if the community consists of people solitary by nature and necessity, and even if it’s cultivated to a large degree by email. Along these lines, I deeply appreciate and admire those writers, prominent writers, who are generous about reading a book by a new writer – or simply a fellow writer they don’t personally know– to provide a blurb. Blurbs, those endorsements on the back of a book, are simply a reality of the business of publishing. Publishers rely on them to sell books. But not all writers have vast networks of fellow writers they count as friends and from whom they can comfortably solicit a blurb. I think writers should try to help each other in this regard. The marketing part of publishing is directed at getting people to read books, and to buy books and support the publishing industry — which in turn enables writers to write and publish. The more people read, the better it is for all of us. Watch Joan discuss why she writes fiction. ArtSake: In a video interview, you mention that the hours between midnight and 5 AM often are the hours of the greatest clarity and access for your writing. Have you found it challenging to balance the unconventional challenges of a writer’s life with other aspects of your life? Joan: Those crazy late night hours are an inconvenient aspect of my writing life that I’ve more or less learned to live with. Sure, every now and then I tell myself that now, this time, I’ll write during the day, but invariably the experiment falls apart after a few days or a week when everything I attempt comes out wooden, and I’m pulling teeth and grumbling at everyone in my path. So then I’m back to keeping hours that make it hard to do a “regular” life and require all kinds of compromises. There are times, for instance, when I don’t go out with people in the evening because it takes too many hours afterward to unwind and get down to work. There are other times when I don’t write at all, weeks or months, because I’m teaching and need to have a more normal sleeping schedule, or I can’t throw myself into the teaching and the writing at the same time. There are still other times when I’ve chosen not to write because there are other opportunities I don’t want to ignore. This year, for example, I was the visiting writer at an Israeli university, teaching the fiction workshop in a master’s program. The workload wasn’t onerous; there was time for me to do some of my own writing. But I chose instead to teach English two nights a week at an African refugee center in south Tel Aviv to people who’d fled Sudan, Congo, Eritrea. There are 14,000 African refugees in Israel, many of whom walked there, barely escaping with their lives, often shot at in Egypt before reaching the Israeli border. I found the teaching incredibly rewarding and a lot of fun. Many of the students were in their early 20s, the same ages as my sons. I learned a huge amount from them. I wrote less but had a life-changing experience. What has helped me with this question of balance – or, more accurately, perhaps, the lack of balance – is to try to fully embrace whatever it is that is keeping me from the writing, including things I didn’t choose, things that are difficult or painful but are simply part of the messy business of life. Joan: Probably the smartest thing I did was to enroll in a master’s program in writing, a low-residency MFA at Vermont College, now the Vermont College of Fine Arts. I was 47 years old and had been writing for 7 or 8 years and needed a more rigorous way of dealing with what I was doing. The beauty of the low-residency model is that, other than going to the campus twice a year for 10-day residencies, you are basically on your own, writing a lot of fiction, but with a mentor, a serious working writer who becomes your dedicated reader. After 2 years of this, with 4 different mentors, you can learn a lot about yourself as a writer. I had wonderful mentors in this program, all of whom wanted me to become a better writer. It was an extraordinary gift. It wasn’t like a typical graduate school with hierarchies and ego stuff; in fact, the faculty treated the students as equals in part because so many of the students were older and accomplished in other fields. It was – and still is – an amazing place. Joan: I’ve generated some very preliminary material for another novel and have the beginnings of several short stories. It’ll be awhile before you – or anyone else – sees any of it in print! Read a full list of events. 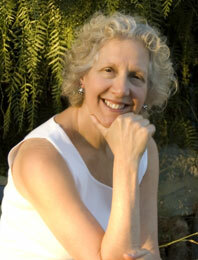 Joan Leegant is also the author of An Hour in Paradise, which won the Edward Lewis Wallant Award for the best book of Jewish-American fiction and the L. L. Winship/PEN New England Award. She lives in Newton, Massachusetts. 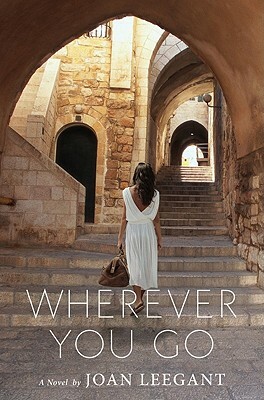 Images: Joan Leegant, photo by Eli Katzoff; Book jacket image for WHEREVER YOU GO by Joan Leegant (W.W. Norton & Co. 2010).